Dying Lights is a game of fleet combat and survival for 2-6 players. Construct battlefleets and send them into combat. Upgrade your fleet with advanced combat technologies - but watch your resources carefully. The galaxy is bleeding to death and with each nightfall more souls wither. The life force means only few can survive and the supply is getting rapidly short. 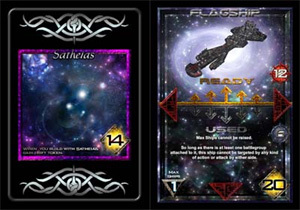 Enter a world of fleet combat in an uncertain universe where peace is more dangerous than war! Do you seek to destroy your rivals or try and find a way to heal the galaxy's wounds, or just try and survive and watch whilst others die before your eyes. The game contains 220 cards, a manual including rules, info and tutorials. Please note that you will need some game tokens and at least one 6-sided die that are not included in order to play. In a Universe where even the stars bleed - can you possibly survive ?